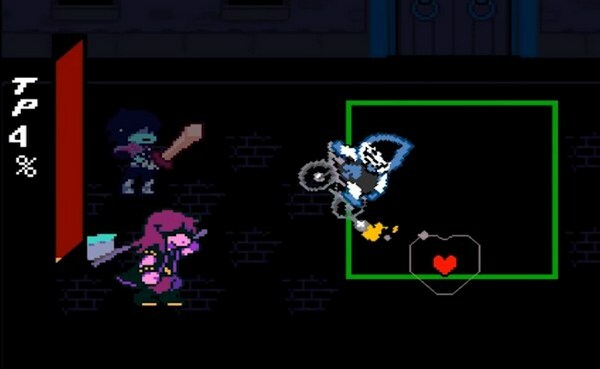 Home » Games » Deltarune First Impression: What is Deltarune about? Undertale is undoubtedly one of the best indie games to date. It is a really trippy, fun, bizarre (in a good way) adventure where every single decision made by players has influence in the game. And so, it was a great joy when Toby Fox, the creator of Undertale, “secretly” release a sneak peak of his next project: Deltarune. Interesting enough, Toby said that this latest work will be extremely different than his previous game. For now, he has only released the chapter 1 of the game so let’s check out: Deltarune first impression! 3. Welcome to Delta Rune! 4. The Story of… Susie? 6. So… What is Deltarune about? 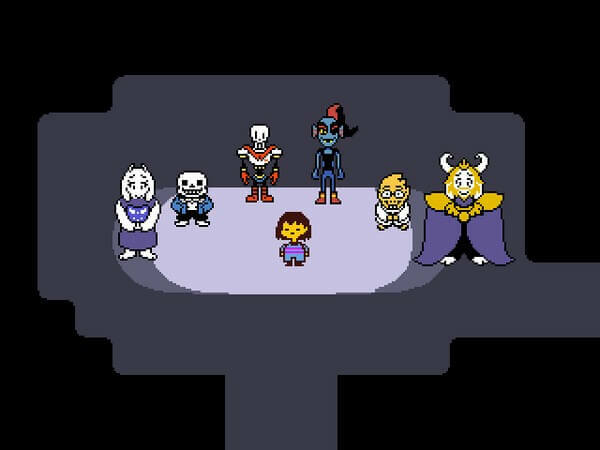 In case you have not realized, Deltarune is the anagram of the word “Undertale”. And right at the beginning of the game, you will eventually many, many familiar stuffs, which make us wonder how “different” this game exactly compared to Undertale? So… who do we play as then? Well, the game immediately introduces us with the main protagonist named Kris, who… looks awfully like Chara from Undertale. Kris is called by goat mom! And she still looks exactly like her version in Undertale! Then, Kris goes outside and has goat mom driving him to school. On their way, we hear that Asriel (yes that exact name) will return next week and we know that he’s now an University student. 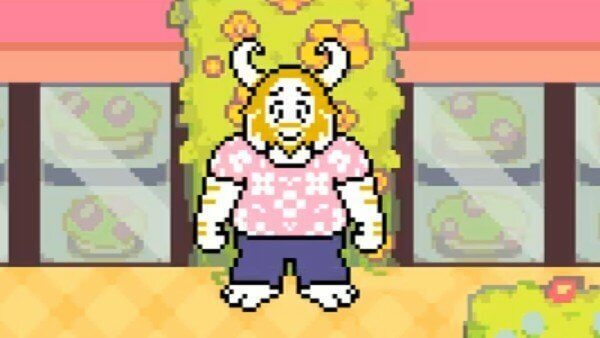 Furthermore, we get to see a bit of the town, including people who are exactly Undertale characters. At this point, we can’t help but wondering: what is this game? Is this Undertale 2 or something? But since we do not have much info so for now, let’s keep on playing. 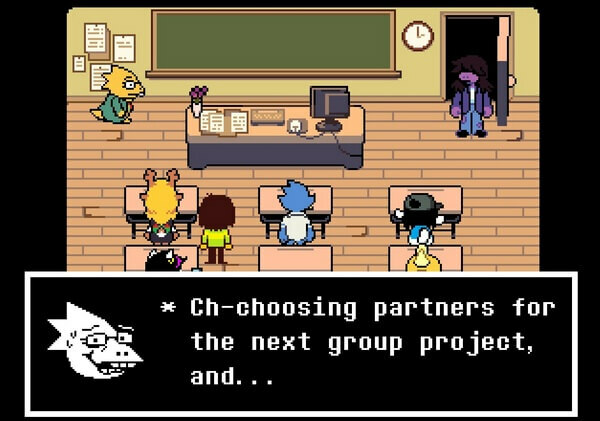 After the trip to school, Kris immediately walks into her class and gets informed that the students are choosing their partners for school project (funny enough, Alphys is the teacher, which kind of makes sense). Players now control Kris and walk around asking students to be their partners but “convenient” enough, everyone already has grouped. At this moment, we suddenly get introduced with a new character – a bully in school called Susie. And as you can guess, Kris has no choice but becoming her partner. 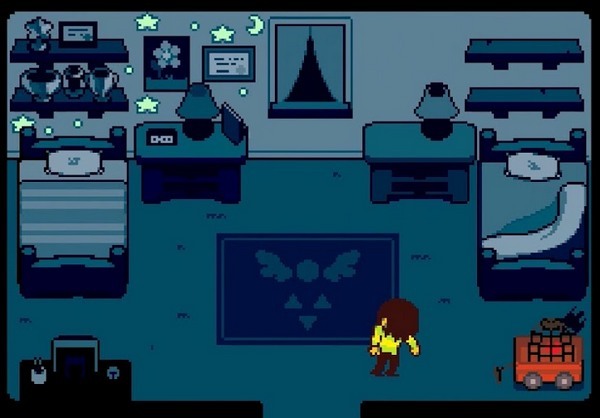 Kris then gets asked by Alphys to go outside and talk with Susie. Walking outside, we see Susie eating… chalk? Susie notices Kris, then immediately slams him into the wall and threatens him. Susie tells Kris to do their project work alone and asks whether it is good. 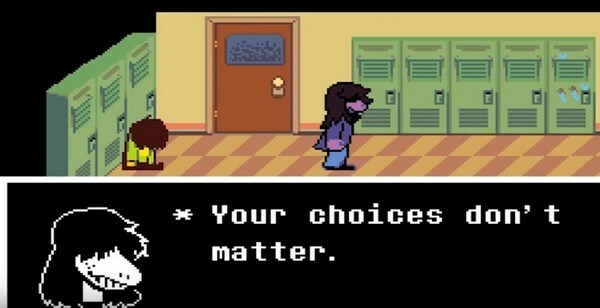 Interesting enough, whether we choose “Good” or “Bad”, Susie will simply brushes it away and says that our choices do not matter. The two go together to the closet room then suddenly the area goes darker and the doors just open. Susie and Kris feel afraid but Susie still forces Kris to go with her regardless. Soon, the two find themselves wandering in the dark and unexpectedly the ground disappears, making the duo fall down. Luckily, Kris still survives the fall only discover that he is now in a strange land and his clothes have changed. And with this, the game finally “begins”. After wandering the peculiar world, Kris finally finds Susie who also has her clothes changed. Together, they walk further into a dark town, along with a dark castle. Then, they meet a mysterious figure who says that he is expecting them. He then speaks of the story in Legend which tells about 3 heroes: 1 Human, 1 Monster, and 1 Prince of Dark who will save the world from its destruction. Of course, Susie does not care about this whole “heroes” or world destruction stuff; she simply wants to get out of here. Then out of nowhere, the mysterious figure gets pushed away by a “bad guy” named Lancer. And so they get into a battle scene which is somewhat similar to Undertale. Talking a bit of battle in Deltarune, the battle scene looks similar to traditional turn-based JRPG. To certain extent, it is an updated version compared to Undertale’s combat. Players can still choose to attack enemy, or instead, try to win the fight without killing/attacking anyone. And just like Undertale, players will have to control the Heart to dodge enemy’s attack. One curious part though is that: players cannot control Susie as she will just do anything she pleases. Back to the story, after fighting for a short while, Lancer “spares” the two and gets away. The mysterious figure now finally returns and reveals himself to be Ralsei (which is an anagram of Asriel if you notice) who looks like an alternate version of Asriel. 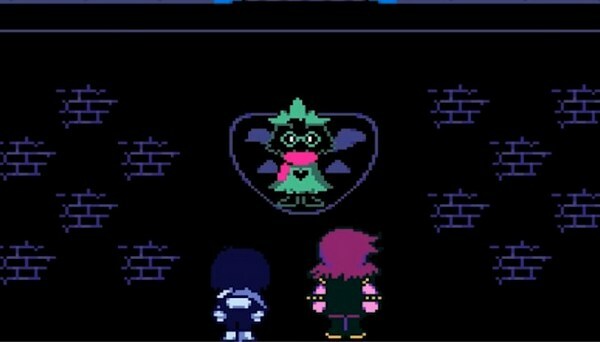 Susie, just being herself, says farewell to Kris and tries to escape by herself, while Ralsei decides to follow Kris. And thus, our true journey begins! 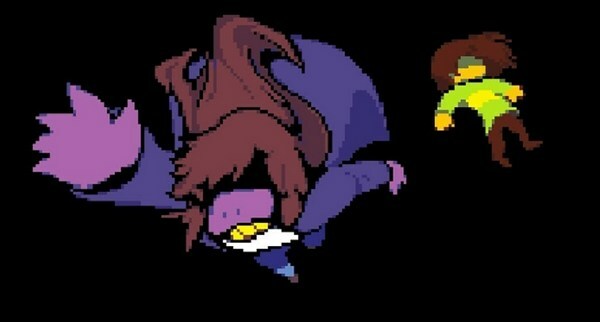 As Kris and Ralsei, eventually they regroup with Susie and together. And as mentioned, we cannot control Susie. She just keeps “ATTACKing” no matter what. 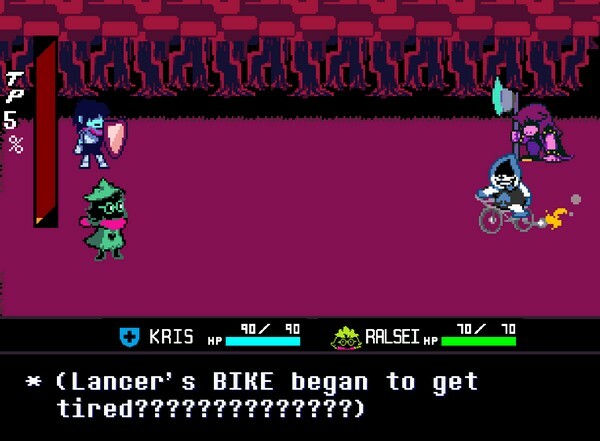 Then at some point, she “betrays” us and joins Lancer instead to do evil thing!… Then we discover that their “evil thing” is not exactly evil at all… Eventually we have to fight against Susie and Lancer. But here’s the interesting stuff happens: Susie who does not care about anything suddenly feels sad when Lancer gets hurt. She then decides to rejoin us and throughout our journey, we constantly meet Lancer and Susie even wants to invite him to join us. 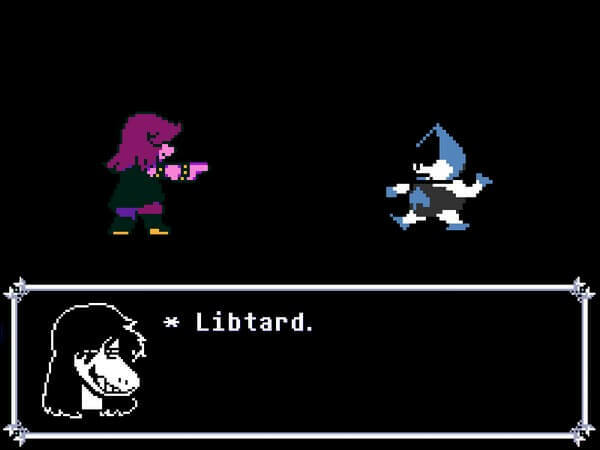 Ultimately, the trio reaches the castle and unfortunately, Kris and Ralsei gets captured while Susie has to confront Lancer. And for the first time ever, Susie openly says that she does not want to hurt Lancer. At this point, her personality has gradually changed from a bully who does not care about anything to a friend who deeply cares about her friends. She even agrees with Ralsei that she will try “ACTting” instead of ATTACKing. Finally, the trio reaches the final destination, witnessing Lancer being grabbed by his father. 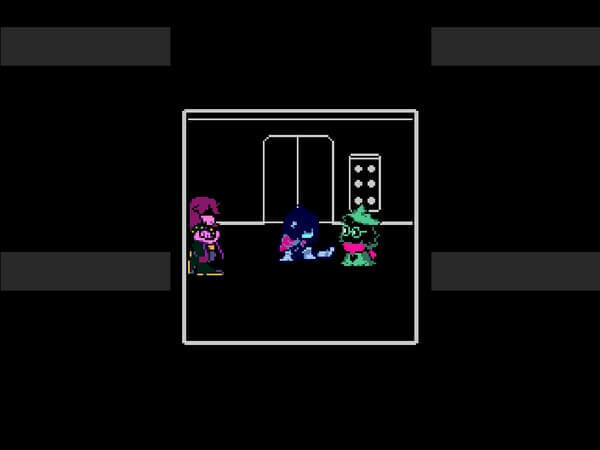 Susie openly shouts out to Lancer’s father to let him go. Then we have a final battle with Lancer’s father and wins, thus we seals the “Fountain of Darkness” and saves the world. After that, Kris and Susie finds themselves return to the real world. Here, we get to see another intriguing scene: as Kris returns to the real world, we see him standing in a classroom which is littered with boardgame. Furthermore, for some reason this boardgame looks like representing the journey which Kris and Susie just took. Okay… this is weird? What happened exactly? Was everything we experienced just some imaginations? But one thing is clear: Susie has changed. She now looks more calm and relaxed. She is friendlier towards Kris and she even wants to meet again tomorrow. Once we get tired of talking to people, it is time to get back home and have some good night sleep… Accept that Kris suddenly wakes up at midnight and walks in really disturbing way. Then comes to the creepiest scene in this game so far: Kris stabs his hand onto his chest, then rips out the Heart and throws it into the cage right at the bottom of his bed. Not only that, he pulls out his knife and looks at the screen with a bright-red eye, strongly reminisce Chara, thus ends chapter 1. If you are just like us who have just finished this first chapter, probably you are wondering “what the hell just happened?” And honestly speaking, we don’t blame you. Just as we said, this game is really a fun, yet trippy adventure. It is really confusing at first but if we start to connect the details throughout the game, we already have a brief answer regarding the theme of this game. Now, let’s remember the beginning of the game. Right at the start, we are introduced with the Heart which highly represents us – the players. Then the game showed us the character creation screen, which we soon found out that it was just a “sweet little lie”. 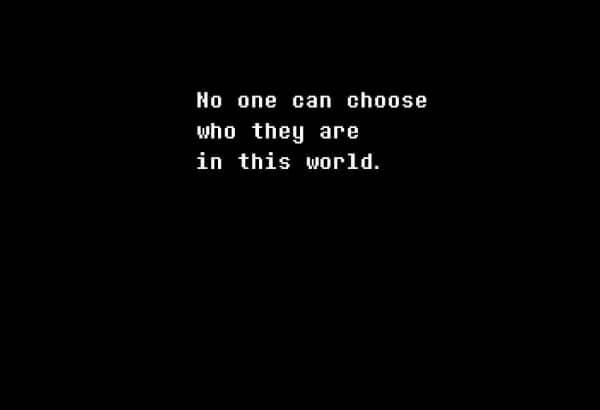 The game even told us that: “No one can choose who they are in this world.” This part is important because it starts the whole theme of Deltarune. And in the end, we saw the disturbing scene in which Kris threw us – the Heart – into a cage. It feels like the game further warned us that our choices do not really matter at all, thus implying that we have no clear role in this game… at least for now. Connecting everything together, we can now see a clearer picture of Deltarune: This is a game where we have no choice! And this is completely different than Undertale. 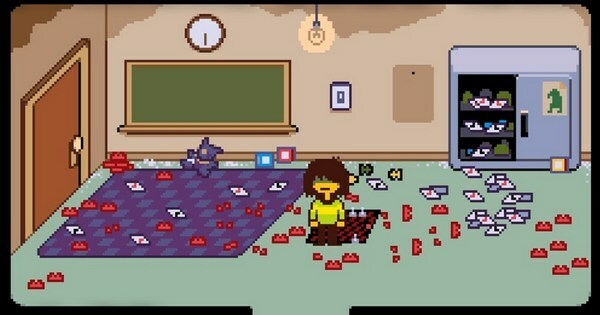 For those who have played Undertale, you will know that it is an unique game where everything we do will affect its world and the outcome. Every single choice matters and we have to accept the consequences of our choice. Yet in Deltarune, we have very little choices. 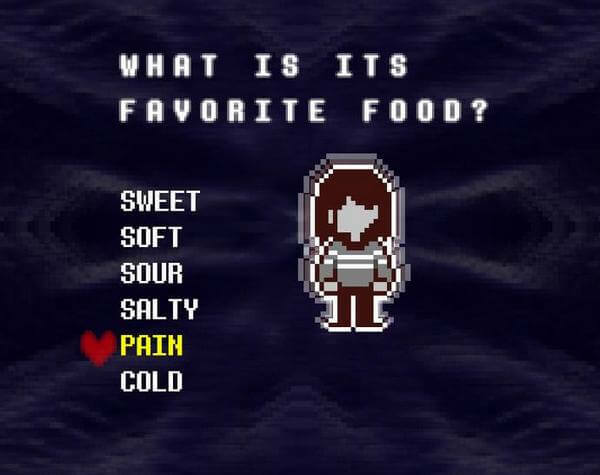 So far the only choices we have are: how to fight (accept Susie), gather items; and free-roaming after escaping from Delta Rune world. But seriously, these kinds of choices do not have any important effect at all! Overall, it is really interesting to see Toby Fox trying something totally different with his new work. 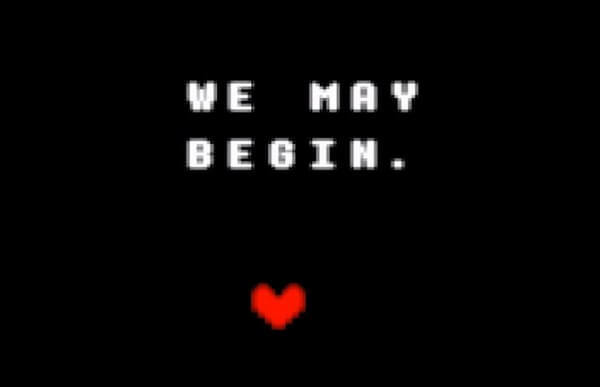 It is a fun experience and truly with that Deltarune chapter 1 ending, we are curious to see what will happen next. And for now, thank you and stay tune for more news in the future!